At the party they were spread out around a dining room table (with a couple of mirrors of course!). My mom gave me the silk scarves to use (they date from her working days at a bank) and she placed them in strategic places to dress things up - she has such a great sense of style! acrylic hand and ramp from Nile Corp. They have real reasonable prices on all their display items. I used some 18G wire to create hooks so I could hang spiders, bracelets, cell phone leashes, ... on the earring stand as well. So one side was all earrings (it was full before the party - LOL! ), one side was bracelet/earring sets and one side was a bunch of misc items like spiders, key chains and cell phone leashes. I left one side empty to make it easier for everyone to see what was available. The shelving unit I got at Michael's for $5!!! It was in a closeout section and it folds up for storage which is really neat! I cut some leftover pieces from curtains for liners on the shelves. I displayed pens, letter openers, some bookmarks and watches on the shelves. I put the bust and hand on the top shelf to add height and interest to the setup. I bought a set of 3 frames for about $7 at Michael's as well. For this show I just used the largest frame and ran a piece of wire in it to hang necklaces and earrings. For the next party I'll put a reflective background behind it and probably chicken wire or such so I can hang more items from it. I'll do the same for the 2 smaller frames as well. I got the necklace display in a closeout sale from jewelrysupply.com. I also brought a book along to show what the book thong/bookmarks are for since some people have never seen them. I grabbed some OLD wine and used those to display the wine charms and used a new pair of crocs to display my croc charms. I've emptied the wine bottles and cleaned them out so I can use them for future displays. The jewelry party was a success! Of course I didn't take a single picture - doh! However I did take pictures of the setup at home so I'll post some of those. Need to download them from the camera first. But now - time for lunch! I'm still working hard to make more designs for my jewelry party (and my mom has made a few too!). In addition to making jewelry and other beaded "things" I've been pricing and packaging everything. I got more display items from Nile Corp including earring cards that hang on a rotating earring stand. To give the earring cards a personal touch I made earring cards out of paper with my logo. I'll take pics to show how I'm attaching them to the hanging earring cards since I think it's a pretty good idea and seems to work well. I'll know for sure after the jewelry party on Saturday! Stay tuned for pictures! 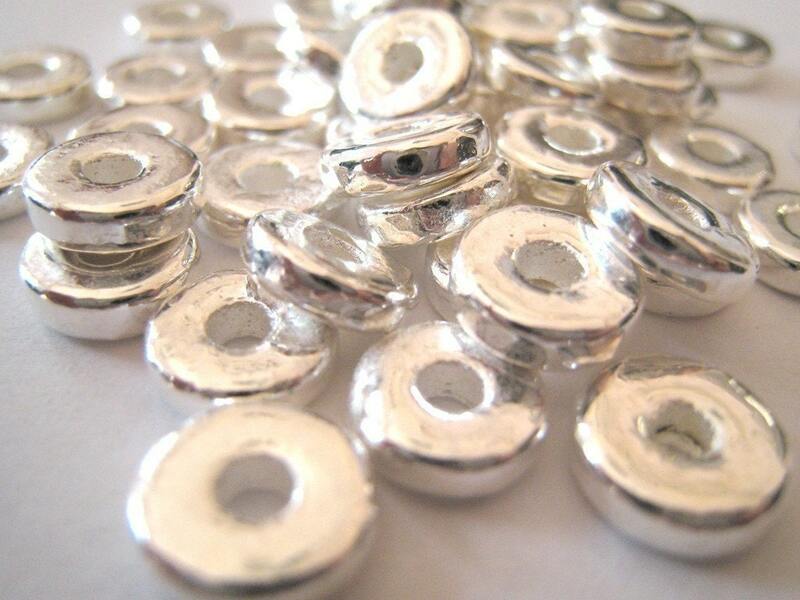 I'm working on a design using the silver disks right now so once I've got it finished I'll post it. 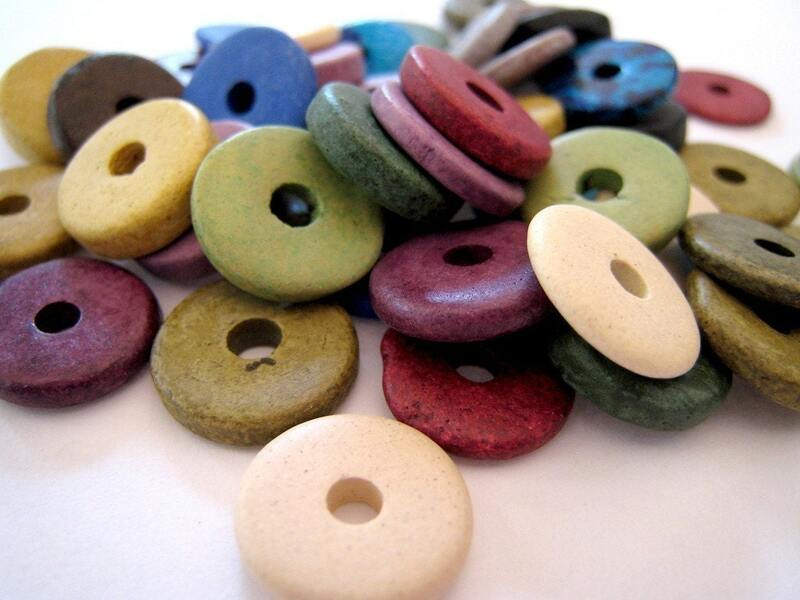 So if you love those ceramic beads you may have seen in various jewelry pieces check out Petite Spoon's store!